Surprise your lady love, or the handsome hunk who stole your heart with a beautifully crafted cake and some fresh flowers to add a vibrant touch. Buy heart shape chocolate cake online, and use the time saved instead of having to visit a local bakery, to pamper your loved one with some quality time and your undivided attention. 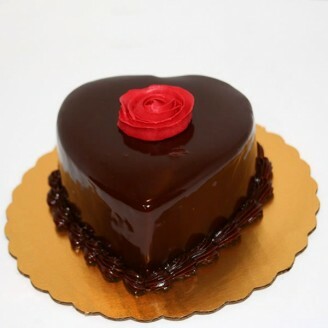 Beautiful love cakes, on offer at our website, are sure to take your breath away. Choose from the delectable spread of flavors and be assured of the best quality and taste. •	A Heart Shaped Chocolate Anniversary Cake is sure to win hearts and brighten the day of your loved ones. •	cakes from branded bakeries. •	Delivery areas: Jaipur, Jodhpur, Kota, Alwar, Bikaner, Ajmer or Udaipur and all other major cities in Rajasthan. •	Delivery Time: 1-2 hours delivery in most cities, while 2-3 hours delivery in remote cities.